Three new limited edition expressions of Johnnie Walker have been created as part of a series of flavour experiments, starting with Johnnie Walker Red Rye Finish. The blending team at Johnnie Walker, led by master blender Jim Beveridge, have been investigating the impact of various brewing, distillation and maturation techniques on the flavour of Scotch whisky. Following hundreds of trials, the brand will release about three new experimental expressions every year within the Johnnie Walker Blenders’ Batch series. 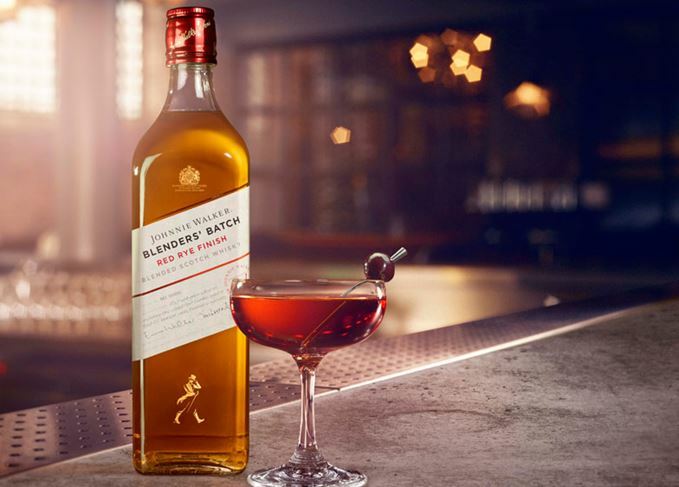 The first release, Johnnie Walker Red Rye Finish, is a blend of three grains – including whisky from the now silent Port Dundas distillery – and malt whisky from Cardhu that have been matured in first-fill Bourbon casks and finished in rye casks. Beveridge said the expression was designed to be ‘a light style, along the lines of an Irish or Japanese whisky’, but with ‘American whisky signifiers’. In addition, Red Rye Finish marks the first time that the blending team has considered a whisky’s application in cocktails as a key part of the production process. The signature serve for Johnnie Walker Red Rye is a Scotch whisky Manhattan – also known as a Rob Roy – with 2oz Scotch, 1/2oz sweet vermouth, 1/2oz dry vermouth, dash Angostura bitters. The taste, Beveridge claimed, was more similar to that of a Manhattan made with American or Canadian rye whiskey, than a Rob Roy made with Scotch. Also coming soon in the Blenders’ Batch series are ‘Bourbon Cask and Rye Finish’ – a 40% abv blend of malt and grain whiskies matured in American oak and finished in rye casks – and ‘Triple Grain American Oak’, a 41.3% abv blend of barley, wheat and maize whiskies matured in first-fill Bourbon casks. All three will be available in select global markets, with Red Rye available at a similar price to Red Label, and the others at a price similar to Black Label. However, none of the first three in the Blenders’ Batch series will be available in the UK. Beveridge added that the next series of Blenders’ Batch will feature other experiments conducted by the team which, although still under wraps, could include the use of chocolate malt, different cut points and different yeast strains. However, Beveridge ruled out the possibility of a grain-only whisky, as ‘Johnnie Walker needs malt whisky for its flavour’. As part of the launch of Red Rye, Johnnie Walker has produced a video following blender Emma Walker as she introduces the expression to the bartenders of New York.